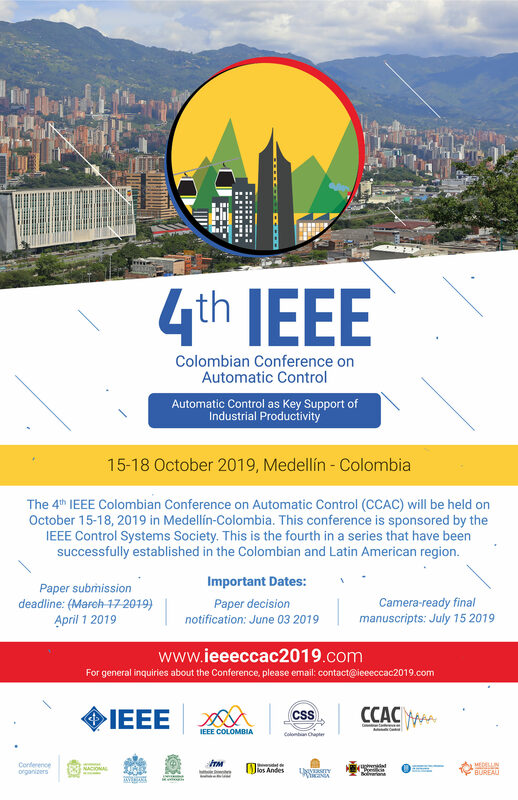 The 4th IEEE Colombian Conference on Automatic Control (CCAC) will be held on 15-18 October 2019 in Medellin-Colombia. This is the fourth in a series that have been successfully established in the Colombian and Latin American region. The objective of the conference is to gather academics and industrial researchers and practitioners to discuss the state of the art, research, and developments in technological advances and applications of control engineering to encourage technology development in Colombia and the Latin American region. The conference includes all aspects around control engineering, from analysis and design to simulation and hardware. The program committee invites you to submit 4 to 6 pages long papers in English through EasyChair.